Joseph Kerwin is a retired American astronaut who, as science pilot aboard the first Skylab mission in 1973, became not only the first medical doctor to practice in orbit but the first space repairman. He received a B.A. in philosophy from College of Holy Cross in 1953 and a M.D. from Northwestern University Medical School in 1957. Kerwin completed his internship at the District of Columbia General Hospital, then joined the United States Navy and attended the Navy School of Aviation Medicine at Pensacola, Florida. He became a naval flight surgeon in 1958 and earned his wings in 1962. NASA selected Kerwin in its first group of six scientist-astronauts in June 1965. 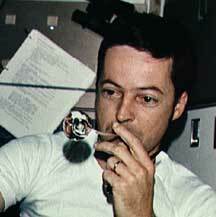 Following his mission aboard Skylab, Kerwin became director of Space and Life Sciences at the Johnson Space Center. He then resigned from NASA and from the Navy as a captain and from 1987-96 held management positions with Lockheed Martin Missiles and Space Company. He presently heads Krug Life Sciences, Inc., which has a major research contract with NASA.